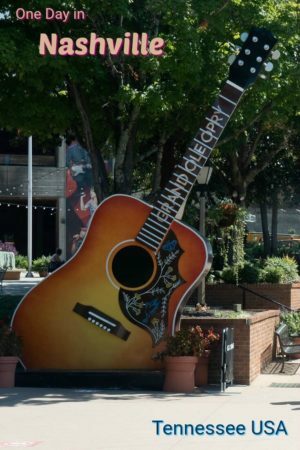 You are here: Home / Travel / Americas / North America / One Day in Nashville Tennessee – Music City Rocks! Nashville caught us by surprise. It’s a vibrant, diverse, energetic, and artistic city that welcomes musicians, visitors, and everyone in between. One day in Nashville is simply not enough. Appropriately earning the moniker Music City, it is the birthplace of country music. For us, Nashville was an unscheduled treat. Nature put a hurricane in our original path, forcing us to change directions. Nashville was the best decision we made. It’s one of the friendliest USA cities we have visited; the unpretentious atmosphere is a welcome change. Nashville is attractive on so many levels. On average, 100 people are moving there each day, making it one of the fastest growing cities in America. While we had only one full day in Nashville, we stayed for two nights as we were road tripping through the USA. We took advantage of every minute, finding endless fun things to do in Nashville at night, as well as during the day. 8 One day in Nashville is not enough. How many will you spend? 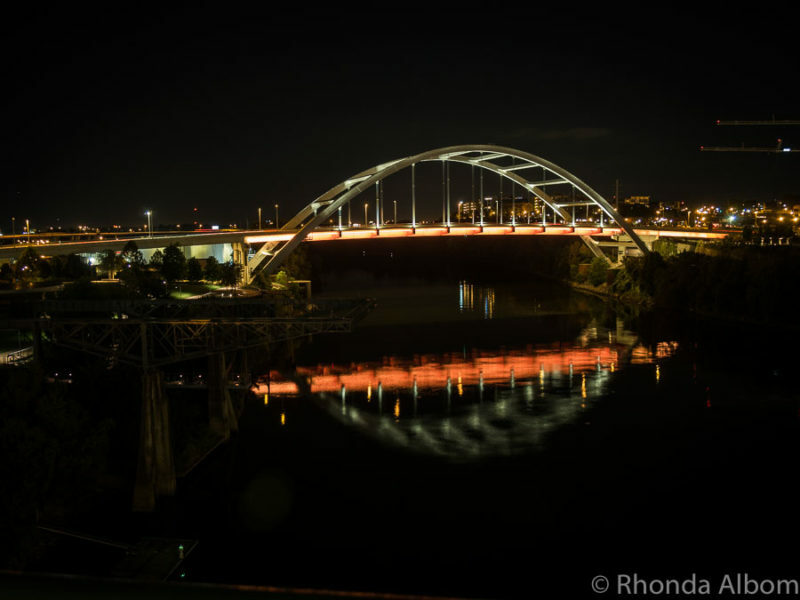 Nashville at night is a banquet for the senses that doesn’t need to break the bank. You don’t need a plan. Just put on your dancing shoes and take a stroll down Broadway. One honky tonk after the next, nearly all with live music pouring into the streets. Some are rooftop locations, others at street level. There are bouncers, and the legal drinking age of 21 seemed to be strictly enforced (this was not a problem for us). Best of all, in almost all the clubs, there is no cover charge nor a minimum drink requirement. The bands collect tips, and the ones we heard were excellent. Inside Alan Jackson’s Bar, one of the many “star” owned clubs on Broadway. 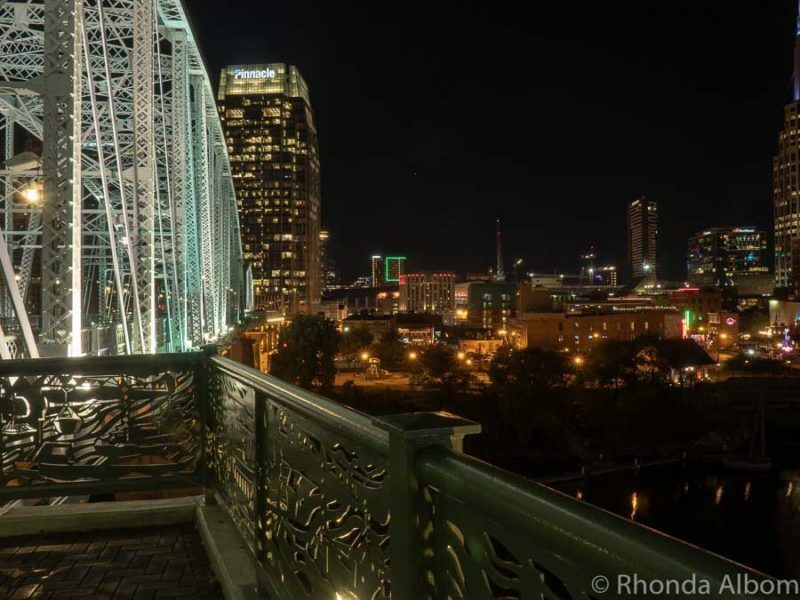 Sometime after dark, be sure to walk about halfway across the to the John Seigenthaler pedestrian bridge and then turn back for stunning views of the Nashville skyline. This is one of the best free things to do in Nashville at night. Nashville skyline at night from John Seigenthaler Pedestrian Bridge. As a country music fan from way back, a visit to the Country Music Hall of Fame has been on my bucket list for more years than I am willing to admit. 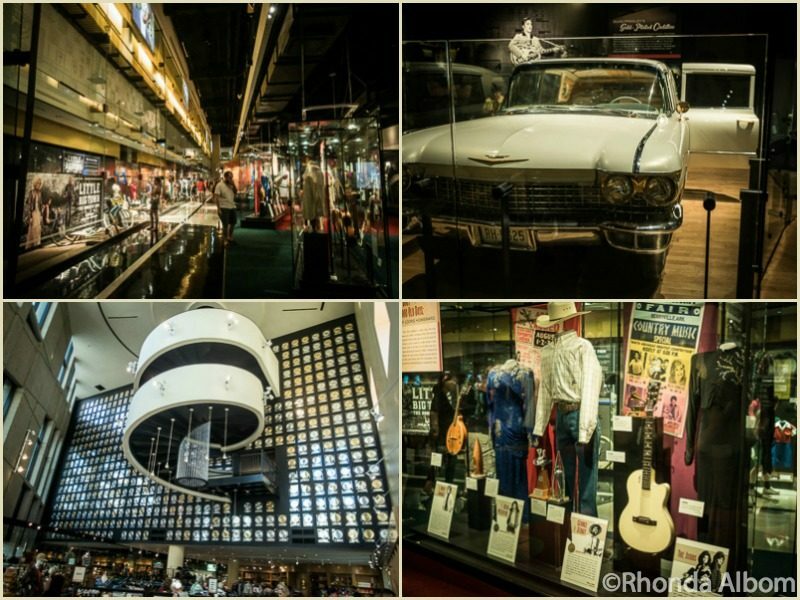 It’s nicknamed the “Smithsonian of country music” for good reason. Starting from the top, we worked our way down, exploring 350,000 square feet of memorabilia. From Elvis to Taylor Swift, every favourite was there along with many performers we didn’t know. The museum houses over two million musical treasures including recordings, rare photographs, stage costumes, instruments, and even a few cars. It is a must see in Nashville. Clockwise: Inside the Country Music Hall of Fame; Elvis Presley’s gold-plated Cadillac; stage costumes and awards from Ricky Scaggs, Reba McEntire, George Strait, and The Judds; gold and platinum records hang on the wall with the spiral staircase that runs between the second and third floors in the foreground. You know you have arrived when you sing at the Grand Ole Opry. Founded in 1925, it produces the longest-running radio broadcast in US history. This live country music stage offers concerts on Tuesday, Friday, or Saturday nights, each with up to eight performers per show. You never know who you will see. Sometimes the most famous of recording artists pop in for a set. 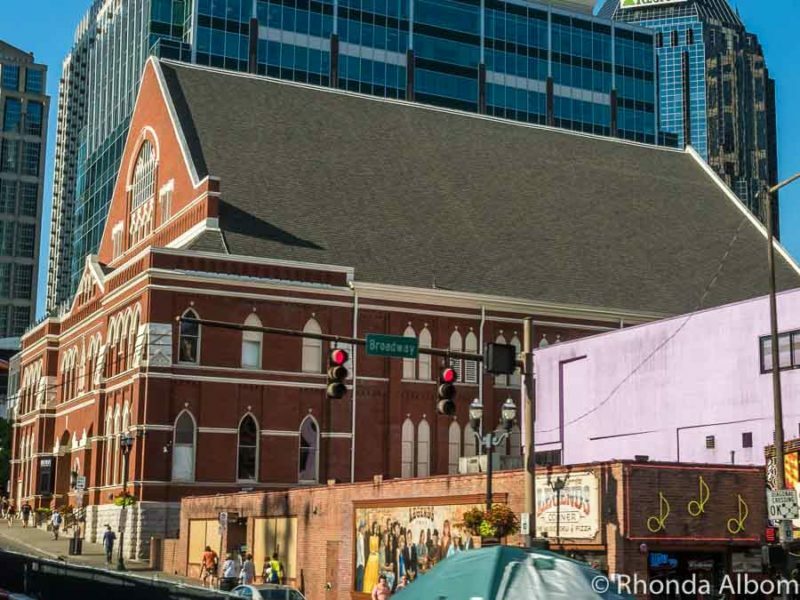 Ryman Auditorium is referred to as the ‘Mother Church of Country Music‘. 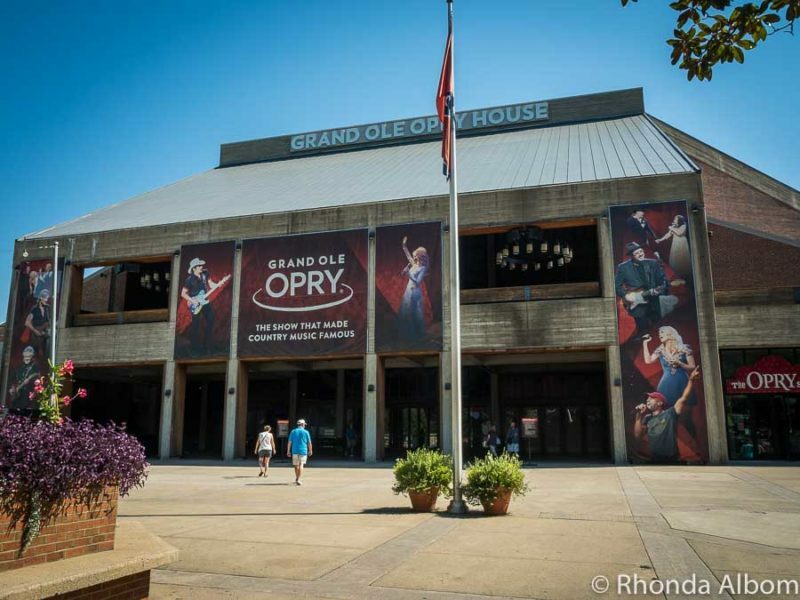 It was home to the Grand Ole Opry from 1943 to 1974. Today it is a popular country music venue offering self-guided multi-media tours. Dare I admit, I always thought Music Row Nashville was a fictitious place frequently sung about in country songs. 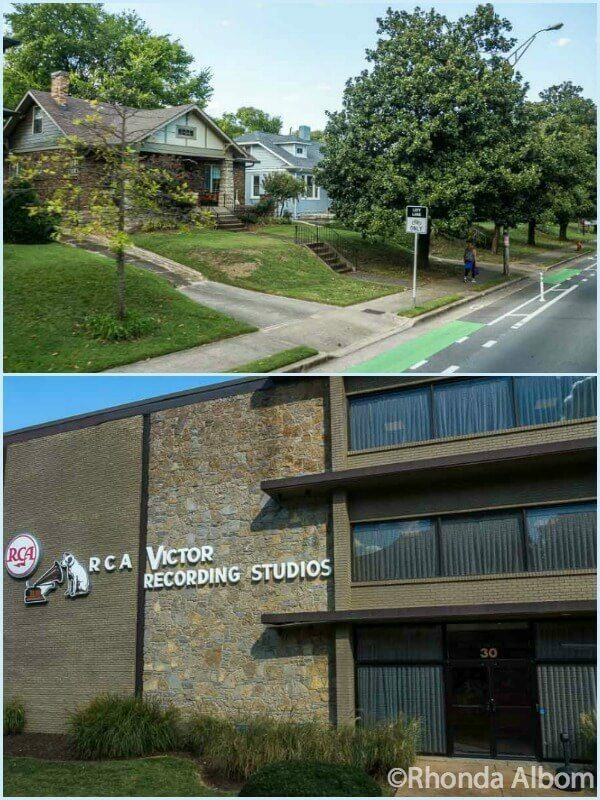 In reality, it is home to RCA Victor recording studios and nearly every major recording agent on the country music scene. The row (street) is a historic landmark, and as such the old home exteriors must remain intact, while the interiors have all been redone. We all know Johnny Cash as the man in black. 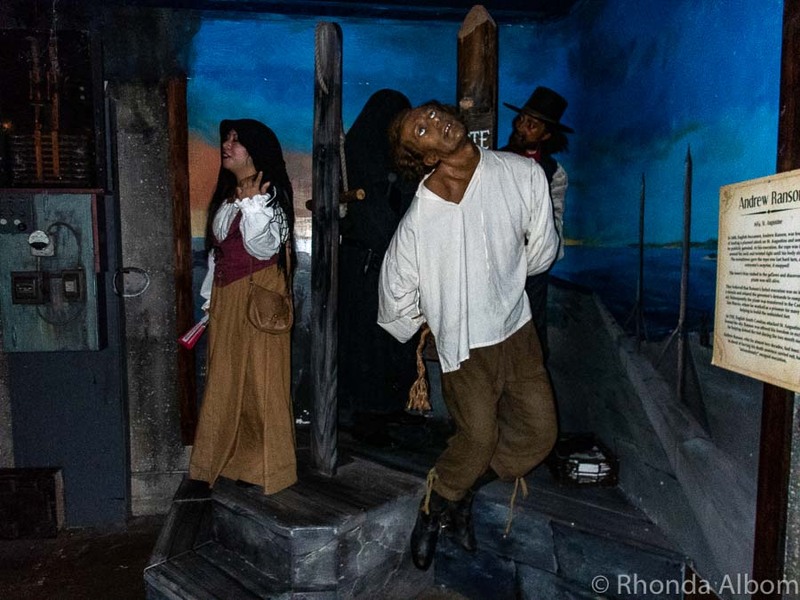 The museum is filled with memorabilia including a stone wall taken from his lake house in Hendersonville, Tennessee. His 1,5oo recorded songs include charted hits on 78, 45, and 33 1/3 RPM records as well as reel-to-reel audio, 4-track, 8-track, and cassette tapes, and CDs. 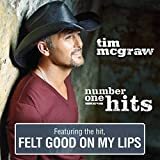 In addition, his hit “I Guess Things Happen That Way” was the 10-billionth download on iTunes. 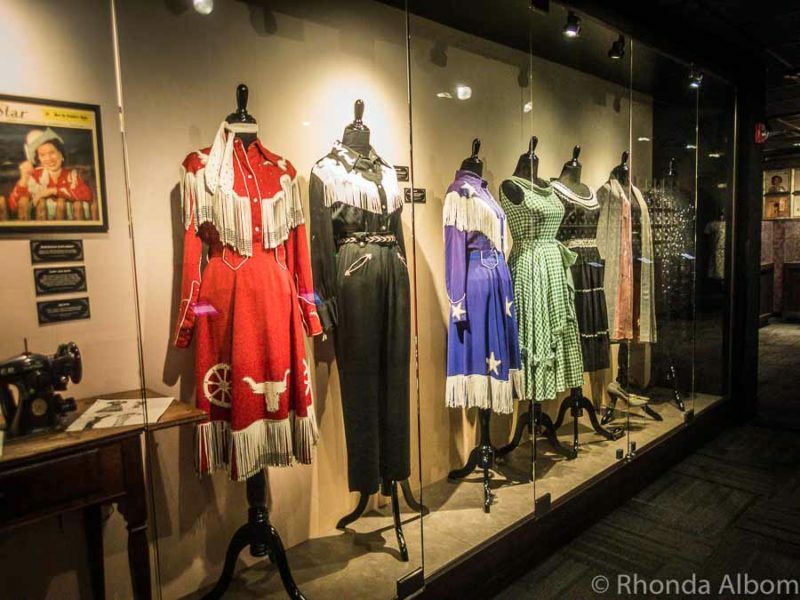 A museum dedicated to the short life of Patsy Cline (1932-1963). She is regarded as country music’s top female entertainer of all-time. 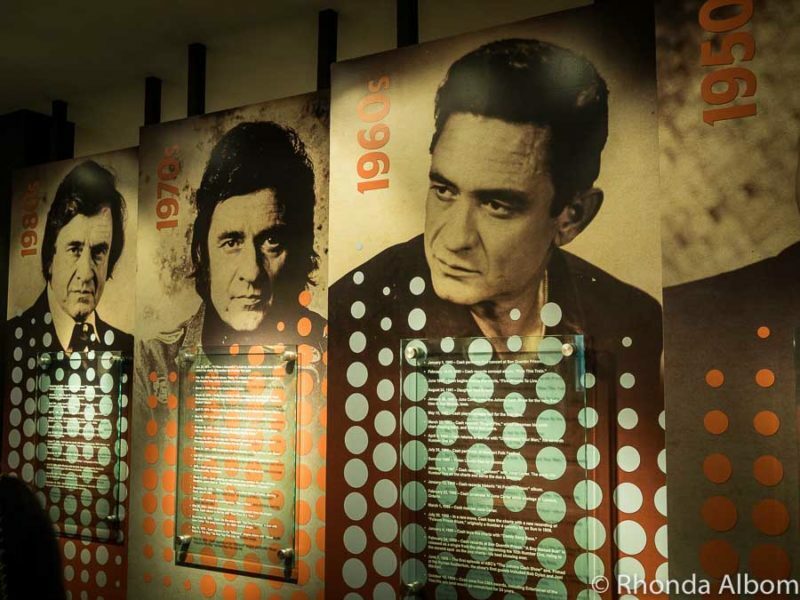 Often thought of as the greatest counter music singer of all time, the museum takes up only one floor of The George Jones, a four-story building featuring a restaurant and rooftop bar. 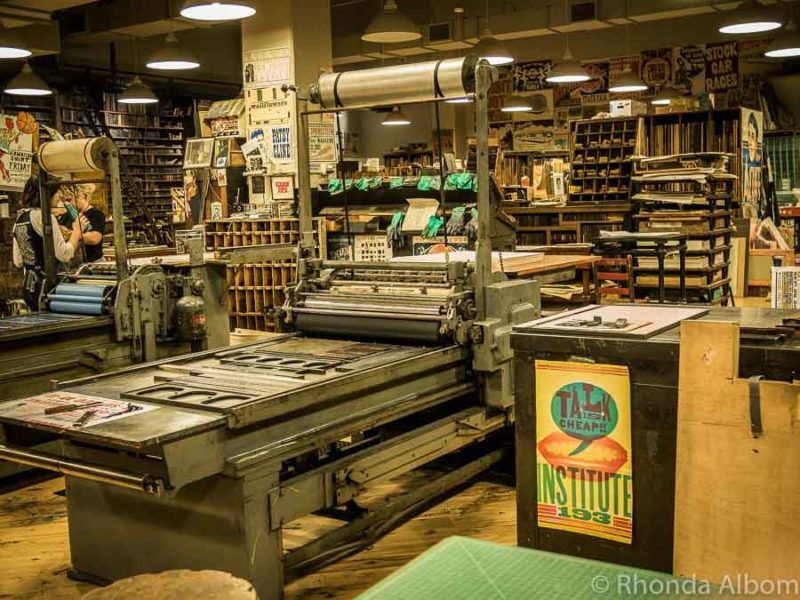 Still doing it the old-fashioned way, Hatch Show Prints uses letterpress printing to create posters for the Grand Ole Opry and other performances. Tours are available, but we just had a look inside from the entranceway. The only rule is no photographing the active printing. There is a full-size reproduction of the Parthenon located in Athens Greece. Inside Nashville’s Parthenon stands a 42-foot tall statue of Athena (also a full-size replica). We saw the exterior from the from the Hop-on-Hop-off bus and opted not to go inside, as we have been to the original in Greece. 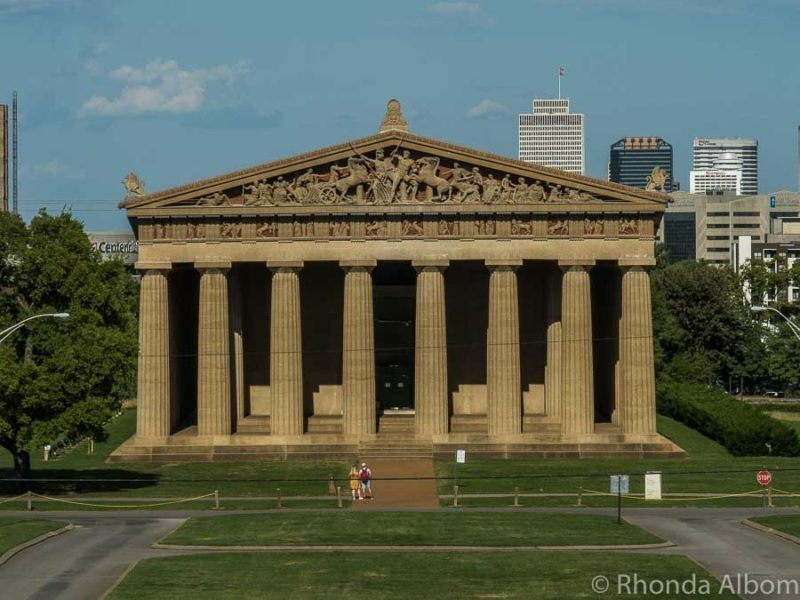 An exact replica of the Parthenon of Athens, located in Nashville Tennessee. 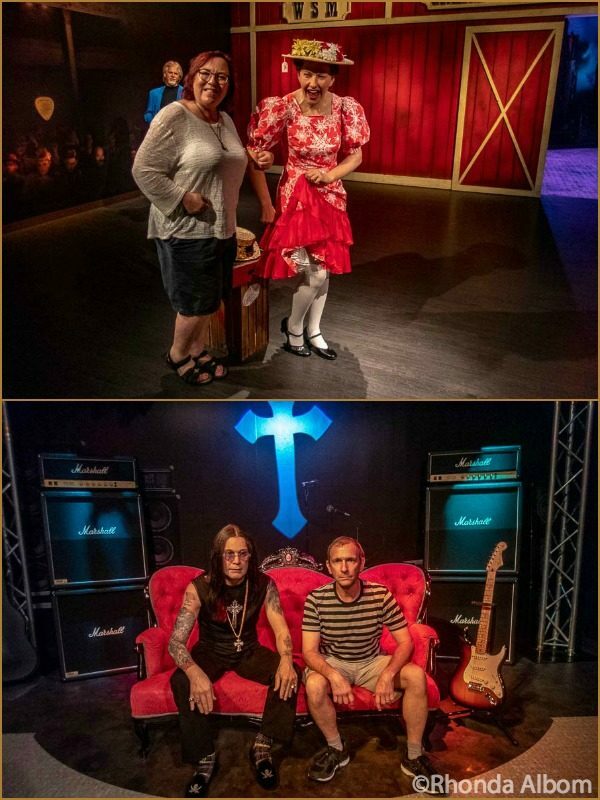 What makes Madame Tussauds so much fun is the ability to interact with life-like wax figures of people we recognize. In Nashville, the wax residents are nearly all music performers in genres ranging from country to rock, pop blues, and jazz. Stop into the Goo Goo Cluster building for free samples. A warning: they are really good. You will most likely buy a few, eat them, and then overpay for more somewhere else. We actually started our day with a ride around the city on this Hop-on-Hop-off Nashville bus. 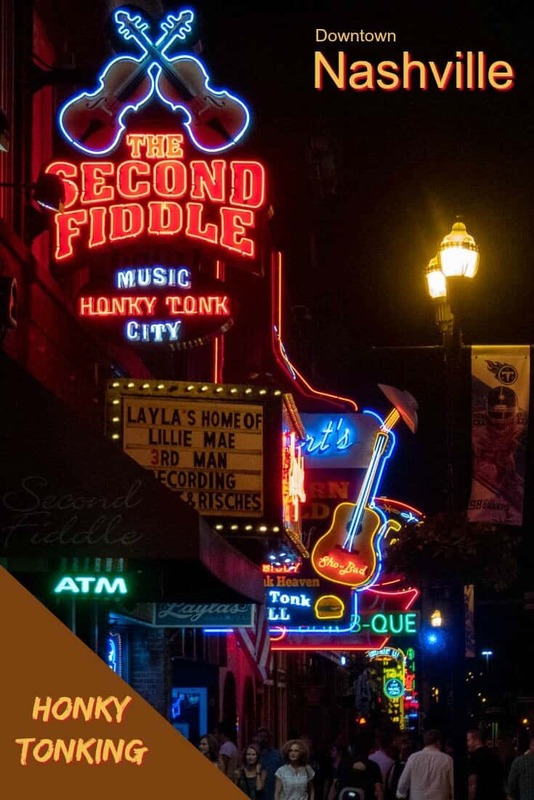 With a comprehensive tour along with the ride, it allowed us to see much more in one day in Nashville than we imagined possible. 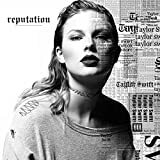 Taylor Swift once owned a penthouse apartment in the Gultch neighbourhood. Musica is the largest group bronze statue in the USA and they are all nymphs. 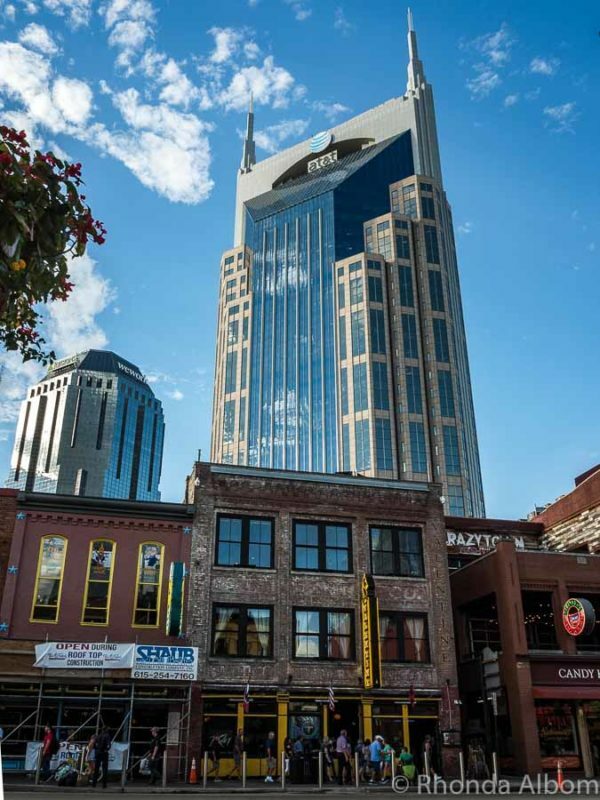 Towering over Broadway, the AT&T building is the tallest building in Tennessee and nicknamed “the Batman building.” Can you see why? 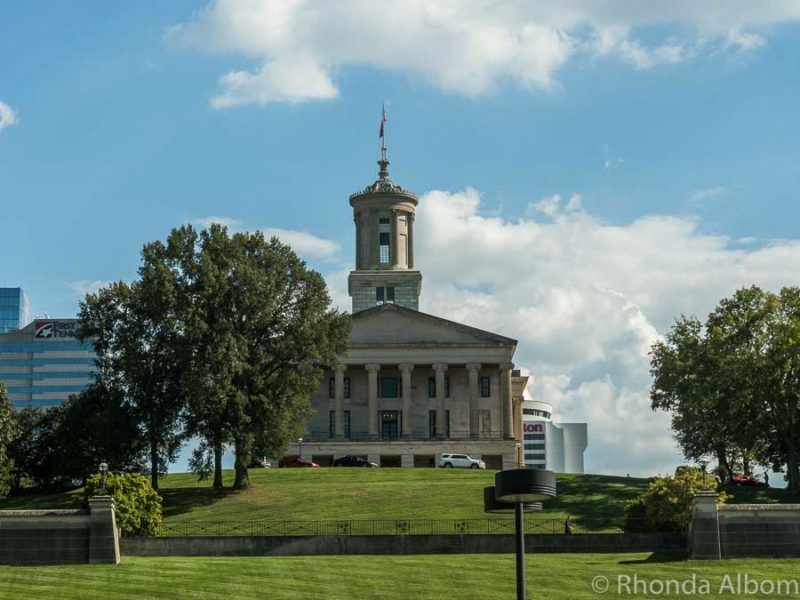 The Tennessee State Capital building is one of only 12 state capitals without a dome. 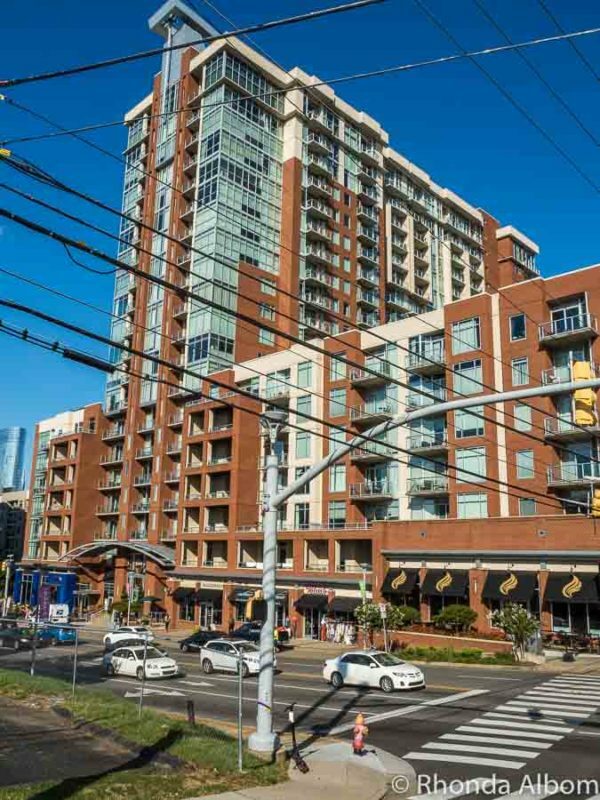 Like all big cities, Nashville offers a variety of options. The best places to stay in Nashville would depend on what comfort level you seek. We slept well in plush luxury at the Embassy Suites Nashville Airport. With a separate room for relaxing, eating, or working, we had more than enough space to spread out. Starting both mornings with a homemade omelette from the breakfast buffet, we were energized and ready to go. Hotel parking is free. The drive into town is quick, and the daytime city parking cost us less than most of the downtown hotels would have charged overnight. 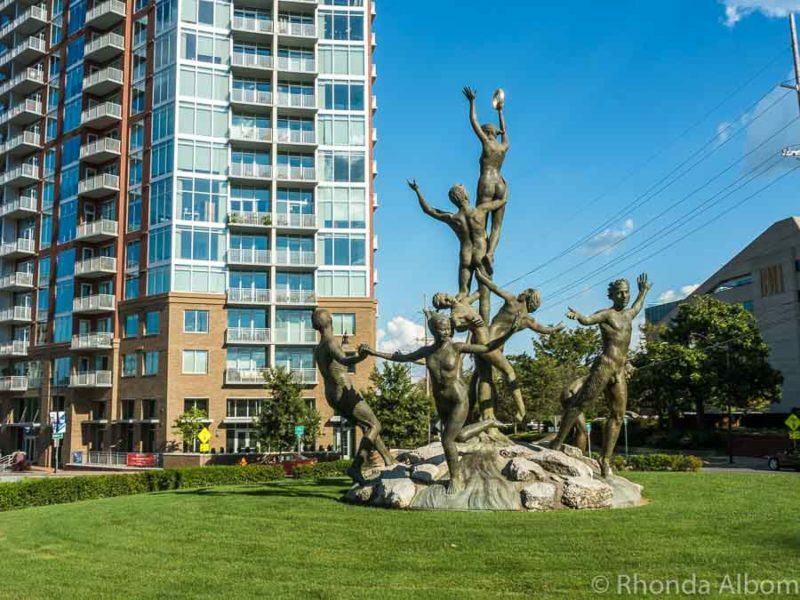 If you want to be downtown, the options range from luxury to hostels. Parking in the city can be expensive. 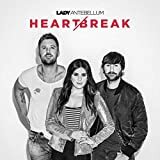 The two cheaper lots we found are at at the Nashville Public Library (enter at 6th Ave N) and under the Music City Center (enter at Demonbreun St or Korean Veterans Blvd). 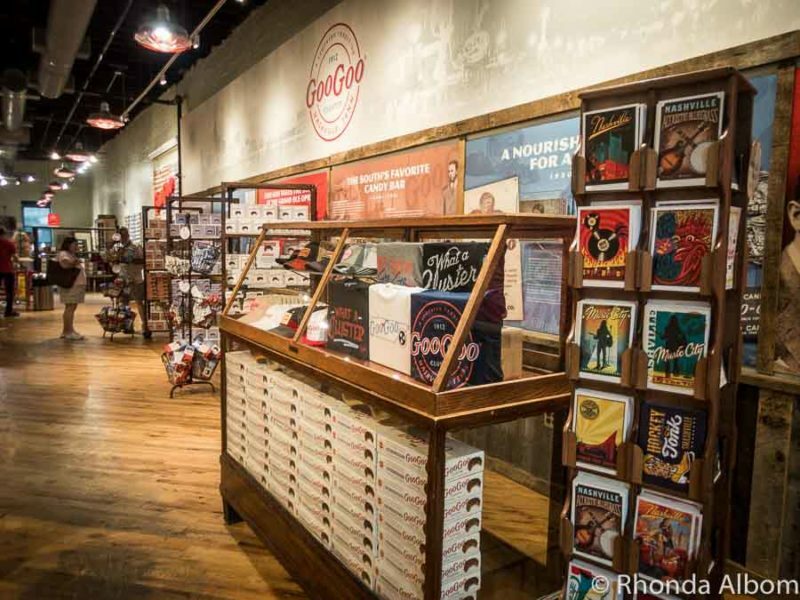 If you don’t want to wander aimlessly, stop by one of the three visitor centers for a map (in the Music City Center, at 5th and Broadway, or at Commerce and 4th). 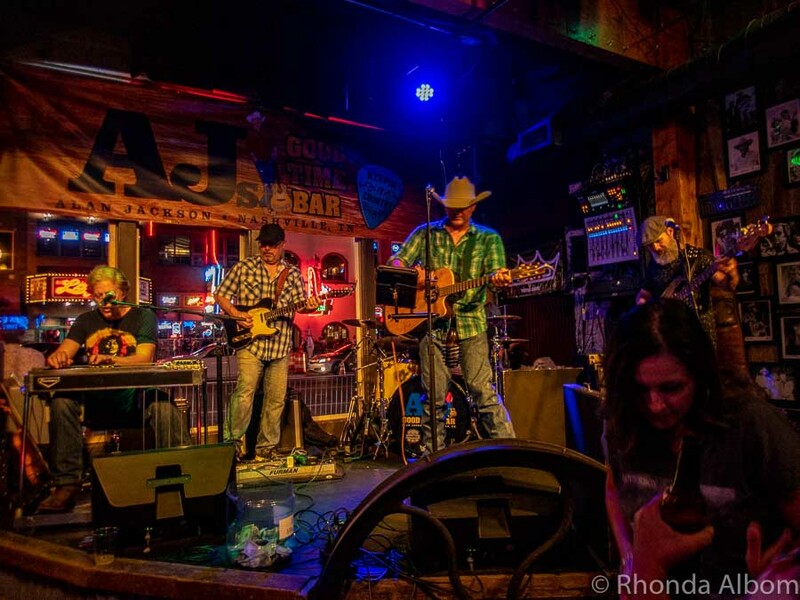 Relax, have fun, and check out several of the honky tonks along Broadway. Include one rooftop one, it’s worth the stair climb for the views. One day in Nashville is not enough. How many will you spend? Disclaimer: We worked with Visit Music City, the Nashville tourism board. Also, we were provided with many complimentary entrances, tours, sample items, or media rates to assist in the writing of this review. The opinions expressed here are strictly our own. Nashville looks great, it’s somewhere I would like to visit someday! Thanks! Wow! You really did make your way around Nashville. It’s a shame we couldn’t get together. So close and yet so far. Oh my God. I didn’t want this post to ever end. I just wanted it to go on and on and on. Nashville seems to be the place to go to. 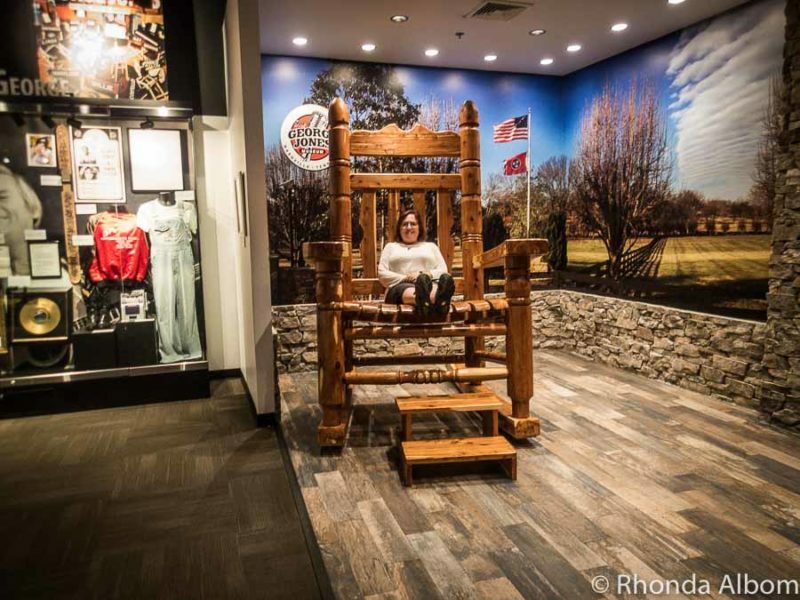 The George Jones rocking chair is so large. It’s like the chair Mary Lou was next to on the Celebrity Reflection our last cruise. I think that I’m going to have to go to Nashville. Yea ha. Sure, I heard about Nashville, but, since I am not a big fan of country music, I never considered visiting it. I guess, one has to leave the country and travel thousands of miles, to regret missed opportunities that were literally right under the nose. Your article inspired me to alter my next visit back home to include a side trip to this surprisingly versatile city. The night skyline of the city is magnificent. I am a sucker for night photography, so it was the last straw to convince me to go there. Cheers! I’ve never been to Tennessee but definitely coming back to this post for some ideas when the time comes! Hi Rhonda, After reading this and seeing your fabulous photos, I’m adding Nashville to my vacation list! What a great stroke of luck that you winded up there and were so pleasantly surprised! Wonderful Nashville guide! I had never thought about visiting until now, it was an unknown city to me. I’ve read quite a lot of posts about Nashville recently. It’s a city I’ve heard so many great things about so I’d love to explore. I hear there’s a wonderful atmosphere there and I do like a bit of country music. Nashville is my favorite city in the US ! I never pass up a chance to visit and I’ve been over 20 times (my mom and I went every summer for a music festival since the 90’s).I always find new things to do and see and eat when I go though. I’m glad you enjoyed Music City – What a great place to land from a hurricane! I can see why it’s your favourite. I am already itching to go back. Yes, he’s quite impressive. I hope you make it there, it’s always nice to tick another place off the bucket list. Wow. 100 people are moving there a day?! WHAT DO THEY DO?? (These are always the questions I have, lol.) I’ve only been to Nashville to visit Vanderbilt… so I can’t comment on the nightlife, but I can say that I enjoyed the food very much. My students also that it’s a remarkably progressive place for being in the south… so maybe another visit is warranted. You got some great night shots of the city! I know, the number shocked me as well. I also enjoyed the food. 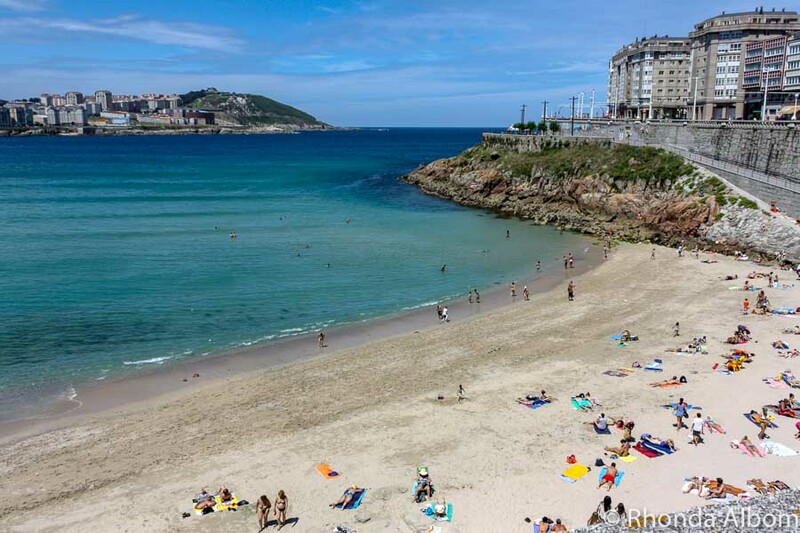 If you visit again, the nightlife is fun and worth checking out. I have heard that this is a wonderful city to visit. Someday I hope to pass through as it is not too far from Florida. I am glad to know it has the Old Town Trolley tours. They are my favorite ‘first thing’ to do in a new city in order to get my bearings. We drove up from Florida. It’s a nice road trip. And yes, I love starting with a small city tour. It makes it so much easier to realise what you want to do with the rest of your time. What a fun time Rhonda. I heard awesome things about this neat town in the South. I see it is well worth a visit. Gotta love it. The awesome things you’ve heard are all very true. It’s a great place. Hope you make it there one day. That is so cool. That is a town that I would love to visit. Thanks for sharing these pics. It’s a great place, I hope you manage to make it one day! It’s a stunning place. I’m glad you like the photos. It’s a great movie. Awww, you were only a stone’s throw away from me! I live in southern Kentucky and we go to Nashville often. I live about 2 hours away. I went to college there for a short time and I love the city. It is growing unbelievably fast! Wish I’d known you were close I would have met you for lunch. There are tons of great eating places in Nashville! It was a last-minute change brought on by the hurricane, so even we didn’t know we were going till a few days before. Pity though, I would have loved to see you. Nashville is high up in my bucket list. So thank you for this overview post. I love it and the photos too. I’m glad you enjoyed the post. I hope you make it to Nashville one day, it’s a wonderful city. Thanks, and yes, it was amazing. Nashville is a great city. I went to college there and lived in the area for several post-college years before moving to Florida. Great post! I’ll bet it was a really fun city for university days. The museums are loaded with memorabilia and obscure facts. They were each so different, but all fun. Hello Nashville looks like a great city to visit. I love country music so I would really enjoy the live music and bars. I would like to see the Grand Ole Opry! Great post, thanks for sharing your trip! Enjoy your day, have a great new week! 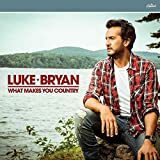 I love country music too, and I don’t hear enough of it where I live. However, hubby’s not a huge fan, yet he really enjoyed it live. I have heard about Nashville. I love that you have included these tours and the duration. When I’m going for a trip this is really useful information. That would be very fun ,dynamic trip and a lot to learn. The tour we took really helped us to see a lot more in less time. It’s wasn’t on my list either, but fate brought us here. It is such a lively and fun city. I love Nashville! My husband and I were just talking about planning s trip there this winter. I’ll have to show him your blog and all the tips you suggested! It is such a fun city, you will really enjoy it. In all our many trips to the U.S we have never been to Nashville. You make it sound so much fun I think I will try to put it on our itinerary for 2019. I hadn’t been before either, but we had to change our route, and there it was a wonderful treat. It’s really a great city. So much to do. We barely scratched the surface. Country music is not my thing, but I have stayed in Nashville and there are plenty of other things to see. Hubby’s not a big fan either, but just hearing it all live seemed to have turned him a bit. And yes, there are plenty of things to do outside of the country music world. Yes, that is what I heard, that it is quite a bit improved over the past few years. looks like you packed a whole lot of fun in a short period of time… my coworkers just went there for a bachelorette party weekend & they loved it! That’s an understatement. We were quite a bit on the go, and enjoying every minute of Nashville. I would imagine it would be a great place for a Bachelorette party.